After their disastrous 2006-07 season, the Philadelphia Flyers underwent a massive rebuilding campaign, which paid off with a return to prominence in 2007-08 and was capped by a surprise trip to the 2008 Eastern Conference Finals. What can the Flyers do for an encore? According to General Manager Paul Holmgren, a lot. There were consistency issues last season, including a 10-game losing streak that nearly cost the Flyers a playoff spot. The Flyers didn't clinch a playoff berth until Game No. 81, and grabbed the No. 6 spot in the Eastern Conference only by winning their final game. Rather than go through another massive roster rebuild, Holmgren made minor adjustments, most based around the salary cap. Forward R.J. Umberger, who starred during the playoffs, was dealt to the Columbus Blue Jackets for a first-round pick. Defenseman Jason Smith and forward Vaclav Prospal left during free agency and veteran forward Sami Kapanen retired, which allowed Holmgren the necessary cap space to re-sign restricted free agent center Jeff Carter to a new three-year deal. Holmgren also added defensemen Steve Eminger from Washington and Ossi Vaananen, who spent last season in Europe. Depth forwards Glen Metropolit and Arron Asham also were brought on board. In the past three seasons, the Flyers have gone from the biggest one-season drop in points (from 101 in 2005-06 to 56 in 2006-07) to a 39-point improvement (from 56 to 95 last season). With a young core that only should be better after last spring's playoff run, that roller coaster should continue to climb. It had been years since Martin Biron was an unquestioned starting goaltender in the NHL, but he showed he could more than handle a major workload. In 62 games -- the most he played in six years -- he had 30 wins, a 2.59 goals-against average and .918 save percentage. He was even better in the playoffs, backstopping the tremendous run. He silenced all the doubters by winning the overtime clincher in the first round against the Washington Capitals and completely stymieing a high-test Montreal Canadiens offense in the second round. Antero Niittymaki is a more than competent backup capable of stellar play if Biron falters or is injured. For the first time in a long time, Philadelphia fans can be confident in whoever their team puts between the pipes. Despite knocking 70 goals off from their 2006-07 nightmare, Holmgren continued to tinker with this unit. Kimmo Timonen and Braydon Coburn emerged as the club's top pairing, and was sensational in the postseason. Their absence in the conference final against Pittsburgh was one of the main reasons the Flyers went out in five games. In his first season in Philadelphia, Timonen was the consistent, rock-solid performer the team so sorely needed. He had 44 points in 80 games, but his contributions went far beyond numbers. The 23-year-old Coburn, in his first full NHL campaign, showed steady improvement as the season went on, and he finished with 36 points and a plus-17 rating. Questions, though, start after the top two. Veteran Derian Hatcher is 36, and chronic knee injuries limited him to just 44 games. After struggling in the new, up-tempo NHL in his first two seasons in Philadelphia, Hatcher became a reliable contributor in his own zone. 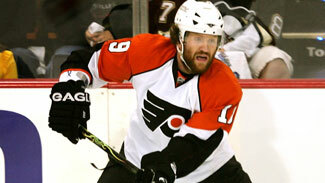 Holmgren has said a healthy Hatcher would be good for the Flyers, but his return is a giant question mark. Randy Jones had a nice season with 31 points and a plus-8 rating and was rewarded with a new two-year contract, but he needs to show more consistency. After a midseason call-up, Ryan Parent acquitted himself well, and only gained status with a solid playoff performance in the conference finals. He'll have every opportunity to win a full-time spot at training camp. A former first-round pick, Eminger struggled in Washington and spent more time in the press box than on the ice. Holmgren, though, was impressed by Eminger's play against the Flyers in the playoffs, and with former junior teammate Mike Richards in the fold, the hope is the change in scenery allows Eminger to resurrect his career. Vaananen will replace the physicality the departed Smith brought to the blue line. He had 15 points and 102 penalty minutes in 45 games with Swedish club Djurgarden, and had 88 hits and 72 blocked shots in 2006-07 with the Colorado Avalanche. With a League-best seven 20-goal scorers last season, the Flyers were the most offensively balanced team in the NHL last season. And from that group, only Prospal -- a trade deadline acquisition who disappeared in the playoffs -- won't return. Daniel Briere suffered through an inconsistent first season in Philadelphia, but flipped the switch in the postseason. He had a respectable 72 points last season, but it was a major slip from the 95 he had the previous season in Buffalo. Also, his minus-22 was among the worst in the NHL. Things changed in the playoffs, though, with nine goals and 16 points in 17 games. Part of Briere's struggles was a lack of familiarity with his new teammates, so with a core group returning intact this fall, that shouldn't be a problem. Mike Richards had a breakout season, posting 28 goals and a team-best 75 points. He played in all situations, and with Smith's departure, will be the first choice for the next team captain. Prior to last season, Simon Gagne also would have been considered for that role. The two-time 40-goal scorer, though, had his season short-circuited by concussions that limited him to just 25 games. Joffrey Lupul (20 goals in 56 games), Scott Hartnell (24 goals) and Mike Knuble (29 goals) picked up the scoring slack last season, but Gagne's return to health is something the Flyers will need to extend their season into June. Rookie Claude Giroux whet the club's appetite with a two-game emergency call-up in February. The club's first-round pick in the 2006 Entry Draft then was returned to his junior club, Gatineau in the Quebec Major Junior Hockey League, where he continued to dominate. After his third straight 100-point season, he went wild in the postseason, with 51 points in 19 games. Giroux will be given every chance to earn a top-six forward spot in Philadelphia this season. Andreas Nodl, a high-scoring forward who spent the last two seasons at St. Cloud State after being taken in the second round of the 2006 draft, also could turn heads at training camp. The well-traveled Metropolit had a career-best 33 points last season with Boston, and should replace Jim Dowd as the fourth-line center. Asham, who has 537 penalty minutes in 498 NHL games, adds grit and toughness to the lineup. * Simon Gagne feels healthy and is ready to return. In fact, Gagne said there was a chance he could have returned last season had the Flyers made the Stanley Cup Final. He's also been working out with Canadian strongman Hugo Girard, who competes in World's Strongest Man competitions. Girard has had Gagne hurl tires and run 30-yard sprints while carrying bags of sand. "It has really helped with my balance and foot quickness," Gagne told the Camden Courier-Post. "I'm in better shape now than before I got hurt." * The Flyers boast one of the youngest lineups in the League, with potentially nine players 26 and under on the roster to start next season. Most of that group -- Jeff Carter, Mike Richards, Braydon Coburn, Joffrey Lupul, Scott Hartnell, Scottie Upshall -- got a tremendous amount of experience during last season's playoff run. That only can help as the group continues to grow and gel together. * It wasn't just the players gaining experience. Coach John Stevens, in his first full NHL season, provided the voice and direction the club needed after the disaster that was 2006-07. Stevens defended his players at almost every turn, but wasn't afraid to juggle lines or cut ice time when it was warranted. Stevens has continued to grow in confidence and stature. He has the support of his players, and loyalty from the organization, as evidenced by the two-year contract extension he received in August.